Please help me identify this tooth. I am fairly new to fossil collecting. Like many I've had my brachiopods and thumb print size trilobites for years, but nothing as cool as an actual fossilized tooth. Hence why I must admit right up front I was recently duped by the whole Deltadromeus label when purchasing something new for my collection. I'm a classroom teacher and I was in the midst of an intense unit on dinosaurs and fossils and I was eager to find some hands on examples to bring to my students. I jumped on an auction site and for a few tens I purchased this tooth. I wasn't motivated by the fact that it was a Deltadromeus tooth, but simply an actual fossilized tooth....something really different from anything I already owned. Trouble is, now I'm not sure how to descibe this item when presenting to students and/or friends and neighbors. I'm excited enough to be holding a fosslized dinosaur tooth. (OK, after saying that I'm holding my breath that it really is a dinosaur tooth after my recent stegosauria dissappointment!) While it would be great to give it a specific name so I could open a book and say "It's from that dinosaur" - it's far more important for me to be accurate, no matter how "general" that accuracy may be. That being said, what would be an appropriate way to identify this tooth? 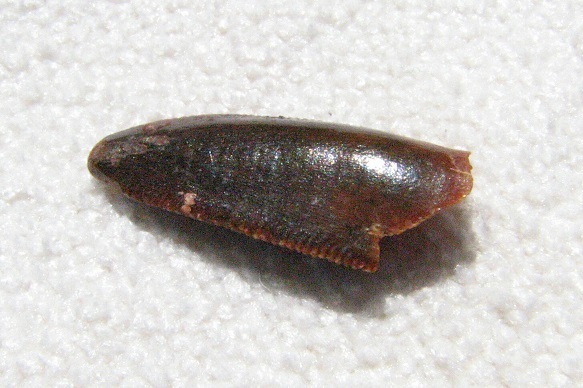 Is it correct for me to call it a Theropod tooth? 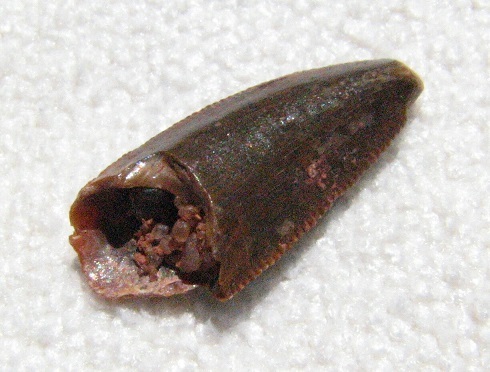 Would it be correct to take it one step further and call it a raptor tooth or is theropod already going too far down the list of scientific classification? 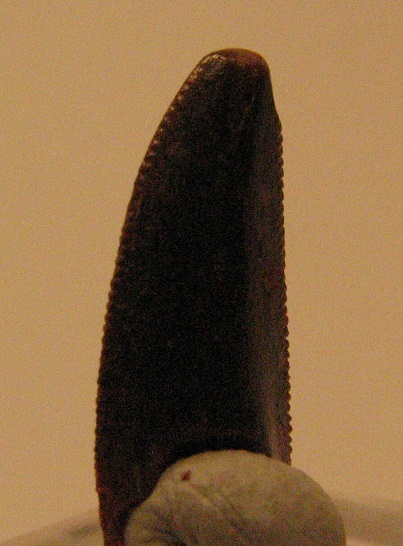 Due to the serrations does that indicate a carnivore tooth or is that simply an assumption? The last photo is kind of dark but it does show serrations on both sides. I am grateful for any and all assistance. I'm assuming this tooth comes from Morocco's Kem Kem Beds. 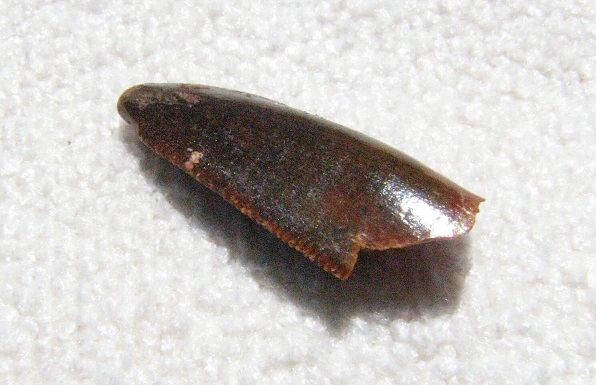 It is a theropod tooth but not a raptor. The only way to identify it to a family level since very little is known of smaller theropod teeth from the Kem Kem and one cannot yet assign any of them to a genus. It should be identified as an "Abelisaurid indet." since the morphology matches that group of dinosaurs. Thank you for your help with this tooth. 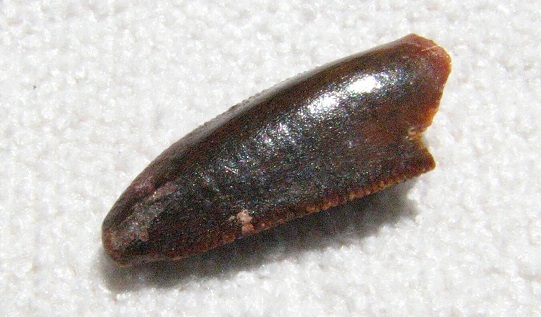 You are correct and I neglected to add originally that the auction stated this tooth came from the Morocco Kem Kem beds. The post linked above is one of the postings I found with info that initially directed me away from labeling this tooth a Deltadromeus. An extremely helpful posting! "Abelisaurid indet" is now printed on my display label.